In our last blog we talked about the importance of the Accelerated Strategy© Approach and how this has a positive reinforcement loop as it supports businesses in their own communication flow through an organisation. Effective communication leads to confidence in securing long-term relationships and by taking this approach one step further, businesses must understand and manage risk through improved operational efficiency, increased integration and greater global coordination balanced with regional fine-tuning within their organisations. These are elements that can be addressed using a global business strategy – often called Operating Model Effectiveness (OME). In the fast-paced industries we all operate in today and in the increasingly diverging international arena, it’s important for us to support clients in maximising value and reducing risk by transforming their businesses to achieve operational, financial and legal alignment. We achieve this by helping clients to optimise and protect their profitability, increases efficiency and creates a solid foundation for sustainable growth. Our approach allows for greater flexibility to accommodate future growth and business change with the ability to better manage the business on a global as well as a regional basis. By defining what, where, how and who is driving value in your organisation you can tailor a structure that provides the right balance between global economies of scale and regional preferences and demand that position your business to respond to future geopolitical, commercial and operational challenges or changes you may face within your industry. 1. Value: What value needs to be created off the back of your operating model? What’s your end goal? Is it clear where and how value is created in your business and who it is that creates the value in your business, as opposed to those who undertake routine activities? 2. Internal challenges: Is there a change within your existing business model that needs to be incorporated? Is there new leadership within the business or organisational structure? 3. Geography: Where does your business model need to operate? Will it be in multiple territories? Maybe you are expanding, or rationalising your footprint or considering your regionalisation strategy. Will you run the risk of over centralising or over localising? 4. Outside challenges: Could you be impacted by external events? Is there a risk of upcoming political change or are new competitors coming into the market? 5. Risks: Have you identified any risks? Maybe from inefficiencies in your operational process or is there a potential supply chain weakness? By understanding how your existing business model will be implicated by any of the above outcomes will help the approach in developing your global strategy, allowing you to implement an effective process that considers and brings all these together to help you achieve smoother operations, greater profitability and more sustainable growth. What you need to be careful of is challenging too far in one direction or another. You need to create a balance as markets change, aligning your products to those changes and continuing to refine your operating model. By managing your stakeholders accordingly, you’ll be able to get them to understand the dynamics and agree to support you in nurturing your model. Remember, customers reward consistent and predictable performance. Your global operating model should drive consistent operating performance regardless of the type of contact you have with customers, their geographic location or your method of delivery. Quality and consistent service delivers value to customers and makes it easier to sell. 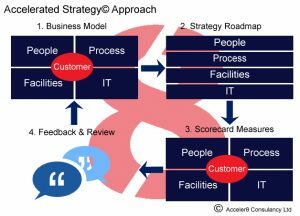 By always reverting back to the Accelerated Strategy© Approach, you will always have continuous flows of communication with your stakeholders and evaluating your operating model after each touch point, ensuring its success. If you’d like to know more about how to implement an operating model into the international arena, get in touch with us today.